Your school is approaching a historic milestone and you are planning for a major celebration with events and galas to mark the occasion. A coffee-table book is both an exciting way to package your school’s history, and an opportunity to build excitement for the future. It is a tangible artifact that will last for generations and give homage to the people and events that shaped your legacy. It is not an endeavor to be taken lightly as it will set a standard for how the school is viewed for this and future generations. A haphazard, ill-planned book will communicate a lack of vision to the audience and reflect poorly on the generation that produced it. We have written, photographed, and produced many anniversary books and can offer some insights from our experience to help you through your journey — and a journey it is! Everything in publishing works backward from the date you want to have your book in hand. That date might be around an event planned for the anniversary — perhaps a party that will bring alumni and donors together at one specific moment — or it may simply be the beginning or the end of that anniversary year. Once you know that date, you are ready to make a timeline for publishing. If a working manuscript is already in hand, it can take between one to two years to design and produce a high-end, archival book. If a manuscript needs to be researched and written, then it takes between two to three years. That may seem like a long time frame but it’s important to take the time to research, conduct interviews, write, research images, design, and produce a high-end archival book that honors the past and will last well into the future. That said, a book can be produced faster, but not at a high quality, archival level. A major anniversary is a once-in-a-generation (or two) opportunity to tell your history, so getting it right is imperative! Once you have made the decision to publish, you will need to determine what your goals are. Do you want a pretty picture book that tugs at emotions through beautiful imagery of the school with a brief amount of text highlighting your history? 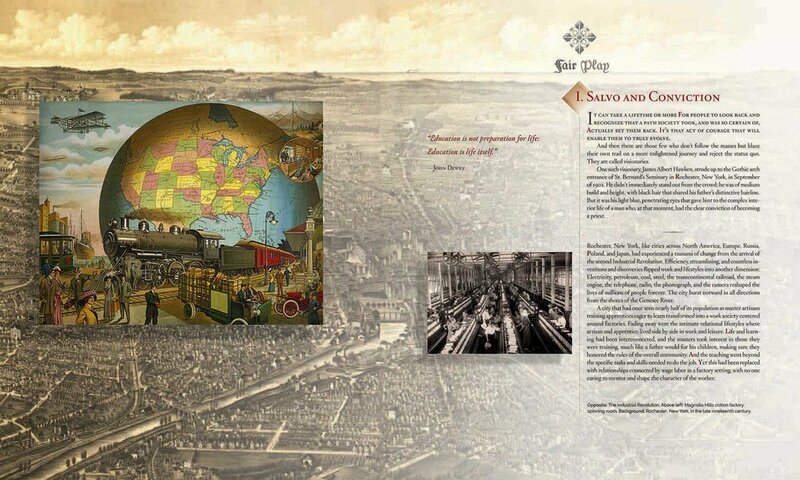 Or do you want a comprehensive history that includes archival and updated photography? Obviously, the first option will take less time. The second option, while a longer process, will be a more useful resource for future generations. These are decisions to be made at the beginning of the planning process. There are technical, aesthetic, and practical issues to be considered. We have listed some of the more important ones along with some of the issues associated with each. Who will write the book? You may have a respected school historian at your school, but writing a book is a time-consuming process and he or she may not have the time to add that into his or her daily responsibilities. And knowing the history and being able to elevate it through lyrical writing are two different things. You have a built-in audience, but they still need to be engaged with the writing. Dry, academic prose will lose all but the most committed readers. We suggest you hire a professional writer with book experience. Another option is to have multiple voices tell the story, enlisting people associated with the school to write essays related to their knowledge of the school. It is advisable to choose people you already know are good writers. You’ll want to give them all a guide to write from, explaining the voice you’d like all the essays to have, as well as whether they are to be written in the first person, or the third person, past tense, etc. The potential pitfall with this approach is an uneven tone to the book, but if you offer enough guidance to each writer and inform them that the stories will be edited for a unified voice, then a book editor can take the essays and make them engaging. The editor must be an experienced book editor; they will use the Chicago Manual of Style which is the book publishing standard. Additionally, make sure you enlist vetters as fact checkers for the final working manuscript. Who are the people who need to be interviewed for a book? You can’t interview everyone, so creating a diverse, targeted list of people to interview is crucial. There are some people who are obvious such as the head of school and chairman of the board. But from there, you will need to decide which voices are important to include. The oldest living alumnus can add color, share anecdotal stories, and personalize the history; undoubtedly you will learn stories that had been forgotten over the years. The student body president can give a student’s perspective of the current times. We also like focus groups and have unearthed a lot of great material from those discussions. Students, teachers, alumni, and staff are all important groups to gain a variety of voices and perspectives. Major donors to the school also make for great interviews. It’s helpful to learn the many reasons they choose to allocate their resources for your school. Archives: We have worked with schools who have taken great care in organizing and preserving their archives, saving everything from early board meeting minutes to every copy of the student newspaper. One college we worked with had a collection of diaries from students in the nineteen-twenties! But we have also worked with schools where archiving was an afterthought, or worse, where the archives had been damaged by flooding. If your school’s archives are not organized, you might consider hiring a professional archivist to come in and put them in order. Design and production: Finding the right designer is like finding the perfect hat, if you don’t have a good fit you either get a headache or it blows away never to be seen again. Designing a book is very different from designing letterhead or a brochure. It’s visual storytelling and books have their own design demands that when ignored, weaken your story and can leave you with a warehouse full of a product that might look like — but doesn’t act like — a compelling book. If you choose to sell your book outside of your school market, then making sure you are registered with the Library of Congress, that you have an ISBN number, and a Bookend EAN barcode are important details you’ll need in order to sell the books. Regardless of your school’s style guide, The Chicago Manual of Style should be used for writing and editing a book. Books are not corporate brochures and trying to fit them into your school’s style guide will weaken their impact. We know this is anathema to your school’s graphic police, but book producers are equally protective of the rules that govern books. It is a grand and long tradition that sets books above other printed materials, so take a deep breath and let them stand on their own. A good history book will outlast whatever branding style your school may now use, they are documents of history and the style should not be bound to current identity branding. Oversight: Who will be in charge of overseeing the project? The old saying: “Too many cooks spoil the broth,” is worth keeping in mind. Everyone involved in the process will want to have their imprimatur on the final product which can lead to a disjointed and uneven book. It’s best to have only one or two point people with the authority to make approvals and move the process along. Distribution, storage, and other issues: How many will you print? Where will the books be stored? Will you charge for the books or will you give them away? Do you want to create special editions for high-level supporters of the school, maybe with higher-end treatment to the cover or a slipcase? Printing and Binding: You can have a beautifully designed and produced book, but if the printing and binding aren’t good, the book will have a limited shelf life. Smyth-sewn books are far superior to books bound with glue only (also known as “perfect binding”), which can come apart over time, leaving loose and lost pages. We work with printers and binders in the United States, Canada, Iceland, and in Asia. Of those, most of the books we produce are printed in Asia, both for the quality of printing and the cost savings, which can be 30% less than printing domestically. However, the books are quite literally shipped back on a slow-boat from China so you must remember to build into the schedule 14–16 weeks after the book files are sent to the printer to accommodate the shipping. When printing and binding domestically, it’s typically about 8–10 weeks; but remember, the cost will be much higher. Interviewing potential book packagers/publishers: As you attempt to choose the person or company you want to work with, be sure to ask for references and for samples of their books. Find out how long they’ve been creating books, because it truly is a specialty. Examine the books closely for the quality of writing, binding, printing, and design. As you look at the book samples, notice those that stand out and don’t look like template books. When you choose the companies you want to get cost estimates from, make sure they are all using the same specifications so that when the numbers come in you are comparing apples to apples. For example: make sure one company isn’t quoting a softcover perfect-bound book, while another is quoting a hardcover smyth-sewn book. As you can see, a lot goes into creating and publishing a book. So, in this digital age when you could place your history into everyone’s smartphone, why bother with the time and expense of creating a physical book? Books last. Studies show that people reading from digital devices retain less than those reading a physical page. Books will be handed down from generation to generation. As a historical document, they will reside in libraries and archives and placed on coffee-tables in homes and offices as touchstones of pride. They are your gift to the future and homage to the past. Demand for e-books is declining and printed books are experiencing a resurgence as people realize they are missing the tactile relationship with books. Your history book is a calling card, a gift to donors, it is, in its physical presence, proof that will outlast the trillions of pixels competing for your attention in the ether. It is unlikely that you will have more than one opportunity to create a coffee table anniversary book for your school. Develop a well-thought-out plan, build a team you can trust, and create a book that will be a source of pride for your community. You have an amazing story to tell, invest the resources to tell it well, and set it free! 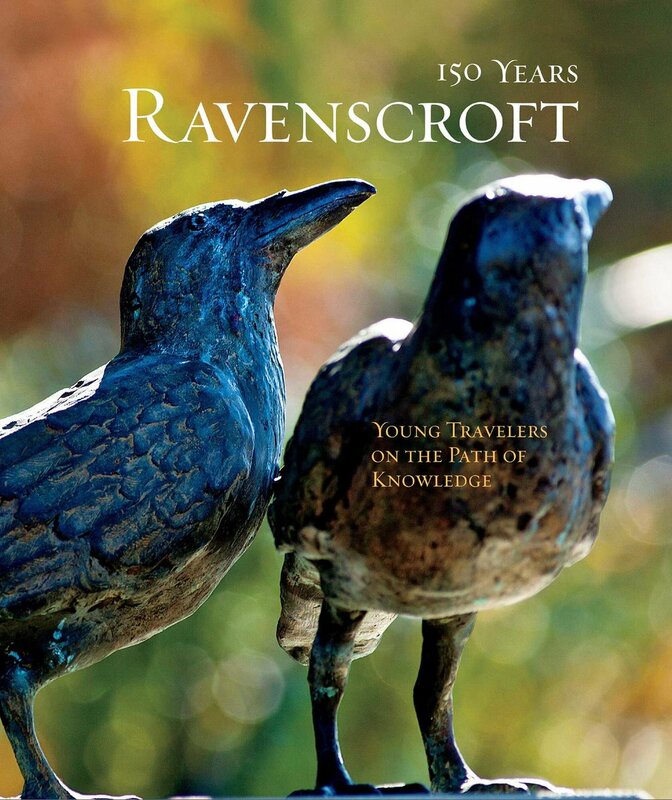 We coauthored the 150-year history of Ravenscroft, an independent school in Raleigh, NC. Laurie wrote the early history and designed the book and Billy picked up the narrative in the 1960s as well as producing new photography. 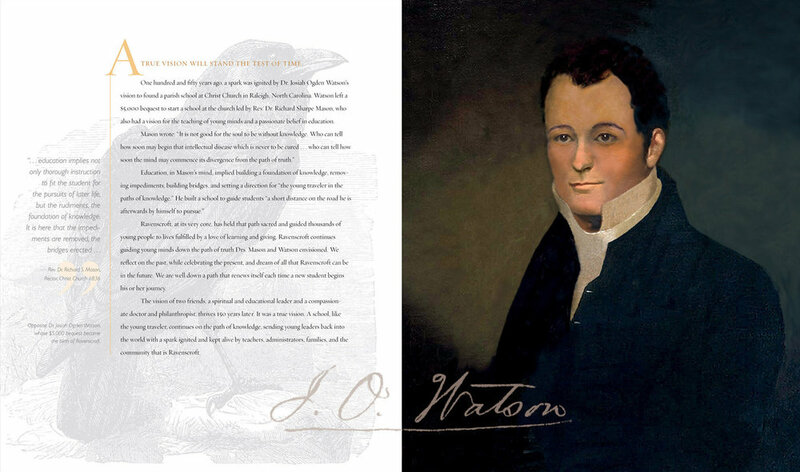 J. O. Watson envisioned a parish school in Raleigh, NC and his bequest of $5,000 led to the founding of a school that is going strong more than 150 years later. Laurie developed this 150-year visual timeline for Ravenscroft. For a book project for Agnes Scott College, Laurie designed a timeline that illustrated the passing of time through the student styles of the different eras. We also coauthored the 100-year history of Hawken School in Cleveland, OH, dividing the writing like we did at Ravenscroft. 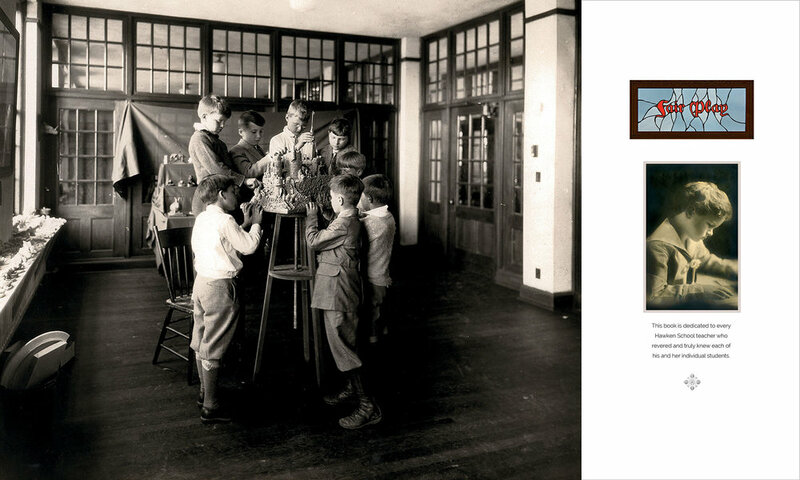 The idea of “Fair Play” was central to telling the history of Hawken School. It is both a motto and an ethos with plaques placed throughout the school reminding students of their responsibility to themselves and each other. Laurie divided the different sections of the Hawken anniversary book with distinctive illustrations, some describing what was happening during that period at the school, and some illustrating what was happening in the world. 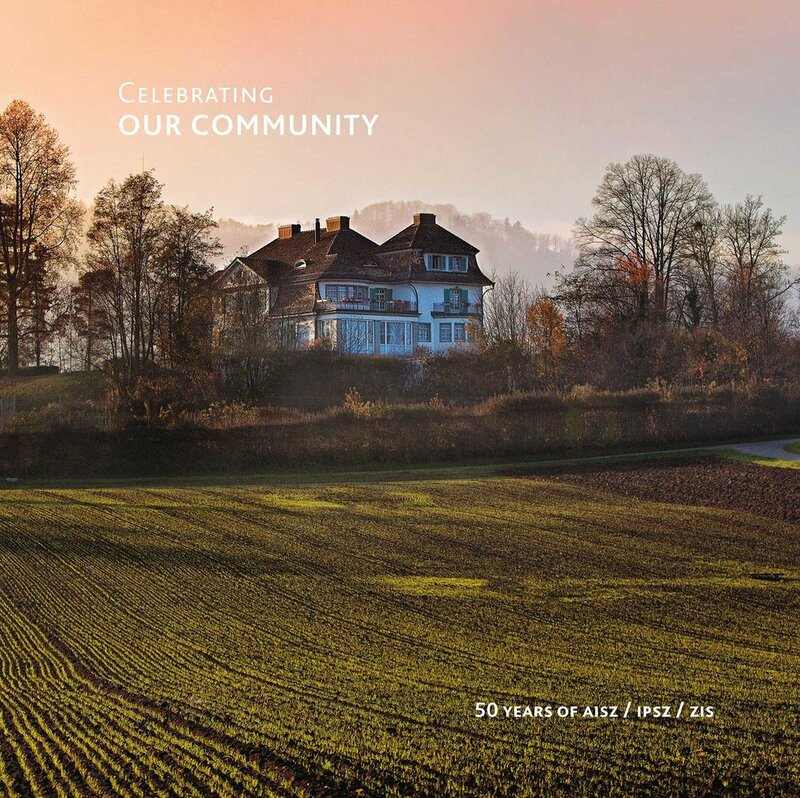 We produced a book for the Zurich International School’s (ZIS) fiftieth anniversary. Rachel Ditchfield, the school’s communications director, wrote the main text and Billy wrote a series of ten short bios of important people in the school’s history as well as creating new photography. One of the profiles Billy wrote and photographed was of Peter Mott, who directed ZIS for twenty-five years. For more brilliant ideas and brain food for your school's marketing and communications, subscribe to our newsletter. We'll make your job easier. Billy Howard is a photographer and writer based in Atlanta, Georgia. He has coauthored three school history books in addition to producing documentary photography books and photo exhibits on public and global health issues. His book Epitaphs for the Living: Words and Images in the Time of AIDS, was the first full-length photo documentary book on the AIDS pandemic. Work from that book is archived in the Stuart A. Rose Manuscripts and Rare Book Library at Emory University as well as in the collections of The Library of Congress Photography Collection, and the High Museum of Art. He was named a CASE Photographer of the Year, and was a 2011–2012 Rosalynn Carter Fellow in Mental Health Journalism. Howard has been interviewed about his work on CBS This Morning, Good Morning America, NPR, and other local, regional, and national news programs. He has traveled the world photographing and writing about schools for their marketing, and fund raising campaigns for more than twenty-five years and is currently working on books for Agnes Scott College in Decatur, GA and Northshore Country Day School in Winnetka, IL. Laurie Shock has designed more than two hundred books, including A Century of Women with Turner Broadcasting, and Isaac Asimov’s Library of the Universe. 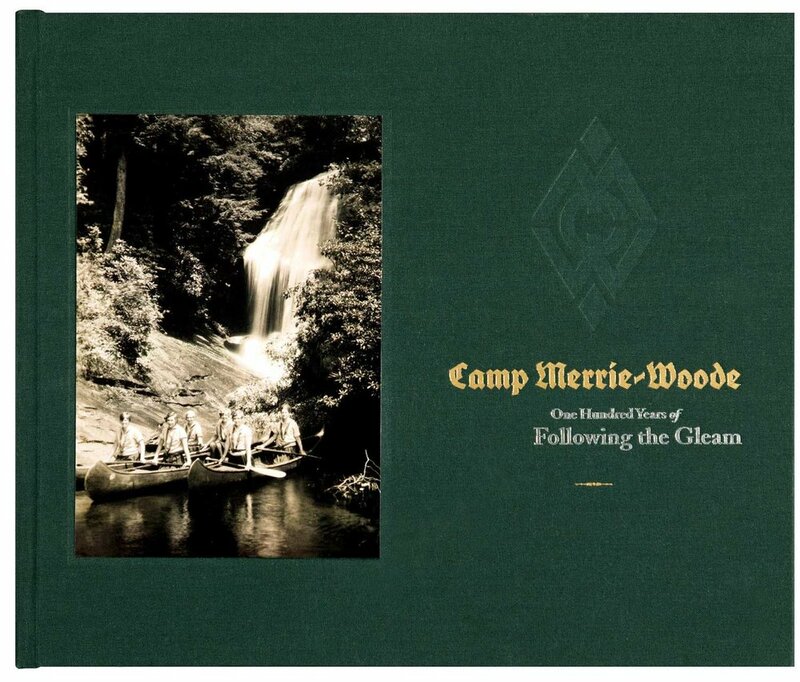 She has coauthored three school history books and is the author of Camp Merrie-Woode: One Hundred Years of Following the Gleam, the history of an iconic girls camp in Sapphire Valley, North Carolina that helped shape the camp movement within the United States. She has produced and designed fine-art and non-fiction coffee-table books for international book publisher Rizolli and Fall Line Press, an Atlanta publishing house specializing in documentary and fine-art photography as well as producing under her own imprint, Shock Design Books. She has collaborated with the American Cancer Society, the Centers for Disease Control and Prevention, and the Carter Center to produce documentary books on children with cancer, global health, and the eradication of guinea worm disease in Africa. Shock’s books have won three Grand Gold CASE District III Awards in the categories of writing, design and photography; three Silver IPPY awards for book design; a Benjamin Franklin Gold award for cover design; four Benjamin Franklin Silver awards for book design; and a Bronze CASE Circle of Excellence Award in book design among other awards and honors.